Most of of my photography work involves editorial assignments for newspapers, magazines and development agencies. During the ten years I lived in India, I was lucky enough to travel all over the South Asia region from Pakistani Kashmir to Sri Lanka, meeting ordinary people and documenting their lives. It is a great privilege to earn a living from this kind of work and it can be incredibly rewarding. But a little variety is never a bad thing and occasionally I get asked to do something completely different. 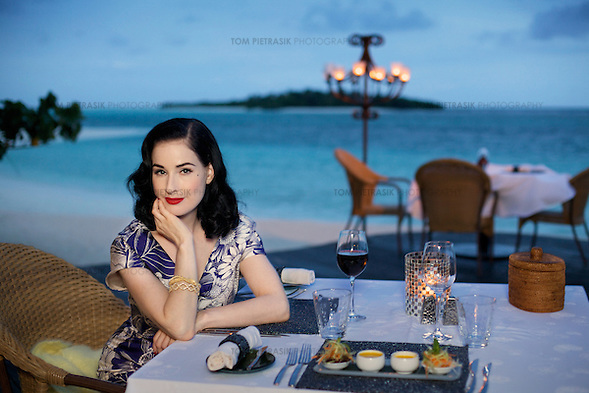 And so it was just over two years ago when the picture editor of a British newspaper asked if I’d go to the Maldives to photograph Dita von Teese for a travel supplement. Dita von Teese was not a name I knew but a quick online-search confirmed the model’s renown and I agreed to the assignment. Disembarking from my sea-plane and onto a pier at Dita’s Maldivian resort a couple of day’s later, I was greeted by the hotel manager with some rather unfortunate news. Just hours earlier, while calling a friend back home in Los Angeles, Dita had been informed that the already-fragile health of her cherished dog Greta had deteriorated. At 16 years of age, it seemed Greta might not have long to live. Dita was quite understandably very upset by this revelation and announced she would return home the following morning to be at Greta’s side during the hound’s hour of need. Monsoon clouds sweep across the Maldives during the month of August so it had been agreed in advance that I would be granted a three-day window of opportunity during which I could photograph Dita. I had calculated that this time-frame would provide me a reasonable chance of photographing in fine weather. But now a dying dachshund living on the other side of the world was inadvertently jeopardising my plans. As my bags were unloaded from the plane and the turquoise sea lapped gently at the shore, the sky darkened and a fine drizzle began to fall. My spirits began to fade. Unexpected events and unforeseen circumstances are an inevitable part of a photographer’s life. Such moments can be the source substantial stress and it is important to minimize the likelihood of them happening. But surprises also have the potential to transform a mundane moment into something very special. I held on to this positive thought as the hotel staff led me to my room. With the rain setting in, my first task was to introduce myself to Dita and then look for suitable photographic-locations on the beautiful island. 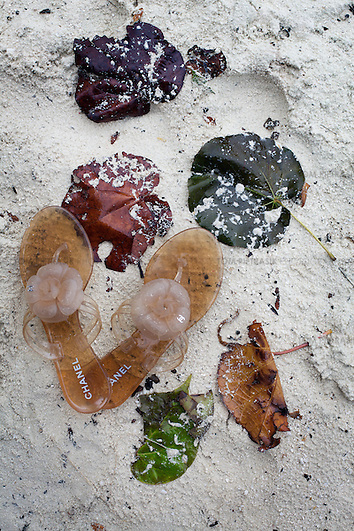 My immediate concern was to identify an environment that provided some protection from the elements while still offering us views of our tropical surroundings. I spotted a wooden platform situated at the top of a beach, it was covered by a canvas roof and draped with net-curtains. This, it seemed, was our best hope. Small teams can be light on their feet and are often best able to respond to changing circumstances. So our little crew set to work: Dita with her suitcase full of vintage clothing, me with my camera and a member of the hotel staff holding a reflector. I discovered that Dita has a deserved reputation for professionalism and hard work and with her distinctive fashion-sense rooted in America of the1940’s and 50’s, we had no need for a stylist. While Dita perfected her look, I was free to concentrate my efforts on composition and lighting. The day’s setbacks seemed to provide us a sense of purpose and a determination as we worked our way through Dita’s substantial collection of vintage dresses and swim suits. An occasional lapse in the rain allowed us to venture onto the beach and with time the clouds thinned, bathing the island in a beautiful soft light – perfect for portraits. By dusk the clouds had dispersed sufficiently enough to conclude our session with some evening photographs of Dita dining at a beachside restaurant. My photo-shoot of Dita might not have proceeded as planned but I like to think that our afternoon together proved that good photography is so often about making the best of whatever fate delivers. By the time I woke the following morning, Dita had left for Los Angeles and five days later – still oblivious to the stress she had caused – Greta the dachshund breathed her last. You can see more of my photographs of Dita von Teese here. Hi! Tom. Love your photographs. There is a real gentleness and integrity to them. All of them are celebratory in one way. And the music is really chill stuff. What is that? Spoke to your Mum and she had said you were getting ready to do photography for Kate’s kid’s clothing business. Wonderful – hope it goes well. I really admire the travel you’re getting in. China to Scotland or is it London, either way that is quite a sweep. Good on you. Every continued success to you.